The documentary takes us on a trip back to the heyday of the recently fallen Sound City Studios, where legends like Fleetwood Mac, Tom Petty and Neil Young recorded seminal records. As the film moves through time, the studio struggles to coexist in a world with Pro Tools and other emerging digital technologies that arguably turn art into craft. Still, the studio continued producing worthy outputs with the help of bands like Weezer, Nirvana and Rage Against the Machine. But in the end, Sound City just couldn’t keep up with a transforming industry. The film celebrates a studio from a bygone era where things couldn’t be made perfect with tools like automation, pitch-correction, and simple copy-and-paste editing. The documentary ends where Real to Reel begins. Grohl transports Sound City’s famed analog console, the Neve 8028, into his own 606 Studios. There, Grohl and friends (a.k.a. an onslaught of some of rock’s key players and Grohl’s personal heroes) do what they do best, take to loudness with their instruments and all of their human imperfections. 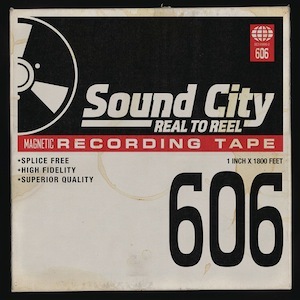 Unfortunately for Grohl-ophiles and music-lovers alike, Real to Reel doesn’t hold up as well as the documentary. The film’s advocation of the “human element” in music isn’t a strong enough thread to hold together so diverse a cast. The compilation comes off as a playlist rather than a collection of songs that celebrate an era. Let’s just say that when an album segues from Rick Springfield to Lee Ving, there are going to be some continuity problems. Perhaps it’s Paul McCartney’s track with the remaining members of Nirvana where we best hear this “human element” that Grohl so reveres. This standout track, “Cut Me Some Slack,” is a true testament to the sentiment that rock ‘n’ roll is intuitive. The “Helter Skelter”-esque track is filled to the brim with intensity and was written and recorded in a grand total of three hours.